Public health approaches to palliative care have been growing in policy importance and practice acceptance. This innovative volume explores the major concepts, practice examples, and practice guidelines for this new approach. The goal of ‘comprehensive care’ – seamless support for patients as they transition between home based care and inpatient services – relies on the principles of health promotion and community development both to ensure services are available and importantly appropriate for patients’ needs. In developing contexts, where hospitals and hospices may be inaccessible, a public health approach provides not only continuity of care but greater access to good end of life care. 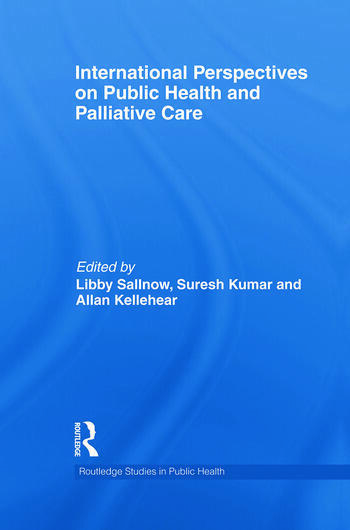 This book provides both a historical and conceptual overview whilst offering practical case examples from affluent and developing contexts, in a range of clinical settings. Finally, it draws together research-based guidelines for future practice. Libby Sallnow is a palliative medicine registrar at St Joseph’s Hospice, London and is the Research Associate at the WHO Collaborating Centre for Community Participation in Palliative Care and Long Term Care, Kerala. Suresh Kumar is currently the Director of the WHO Collaborating Center for Community Participation in Palliative Care and Long Term Care. Allan Kellehear is Professor, School of Health Administration, Dalhousie University, Halifax, Nova Scotia, Canada. He was formerly the Professor of Palliative Care at La Trobe University and was director of Australia’s first policy and practice palliative care unit in a school of public health.